Discussion in 'Replica Costumes' started by PrimoOptimoso, Oct 18, 2011. Thanks to some incredibly detailed searches by enterprising folks around the web, and a really great welding supply company (WelderSource), thus far I've got THE actual models of both the gloves and the boots used in the filming, as well as the closest thing readily available to the actual goggles (newer version made by same company). 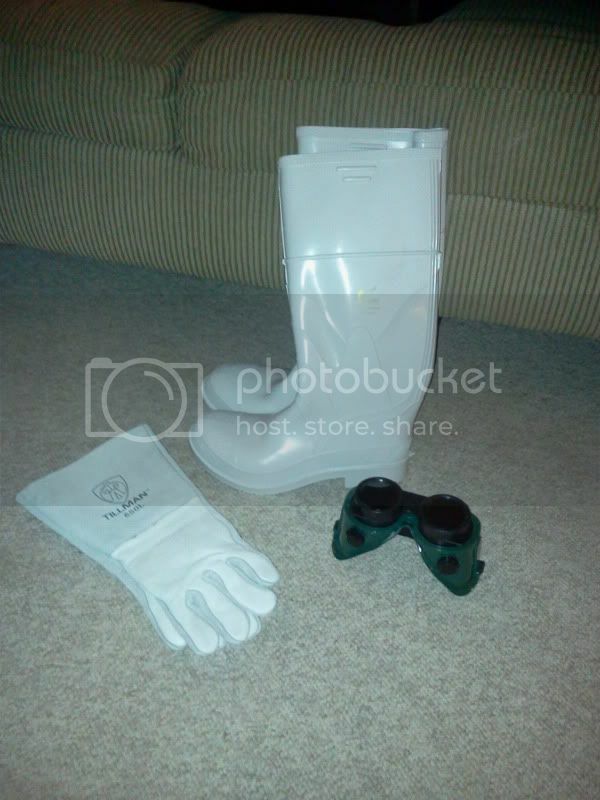 Note: if anyone out there is going to do the same, the boots are $85 from Morton Safety but only $22 on eBay through a different welding supply; just search 'white rubber boots'. Found that one out myself, luckily. A paint job and a couple extra vents constructed will help the goggles reach maximum Horrible, and I either need to try to mute the logo on the gloves or paint the whole of the cuffs white; have to watch the show again to be sure. 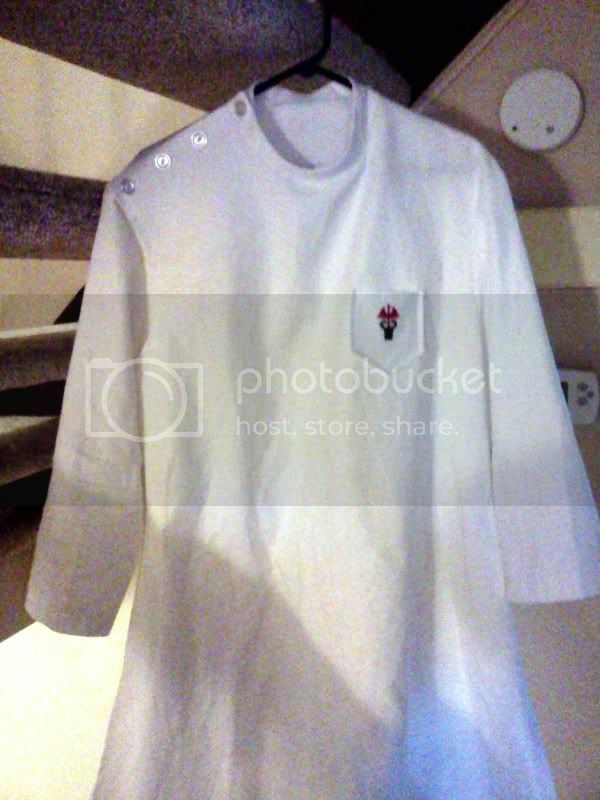 I also am making the lab coat from scratch, with the pattern by Erica Binns at barefootsewing.com - wish me luck! Haven't used a sewing machine for any more than a few stitches since I was in junior high! I had only seen part of Dr. Horrible until I rented it yesterday. My co-worker made that costume last year and wore it to work. Not a lot of customers recognized the costume. Since I was 1940s Clark Kent, they assumed he was a mad scientist. Close I guess. Slight update. Sadly, I've been incredibly busy with actual job work so the sewing has fallen mostly to a very generous friend of mine who brought her machine and skills to help. It's coming along, though! I am going to be sanding the logos off the gloves and painting the goggles today as well. Well it's done and I will post pics soon (I know, how can you have a thread without pics!?!) - what a comedy of errors its construction became, but turned out ok.
EDIT: Pics here! I forgot I took a few with my phone; sorry about the quality, but here are what I have thus far! The lab coat - thanks again to Erica for the pattern, and my friend "Erynies" for the machine sewing! It's not perfect: I could only find white, rather than offwhite, twill; I had to resize a couple pieces by eye (I'm apparently between sizes) and fuse a layer of interfacing to the back of the front panel to make it less see-through; And without a buttonholer, I sewed the buttons to the top and went with velcro for the actual attachment points. 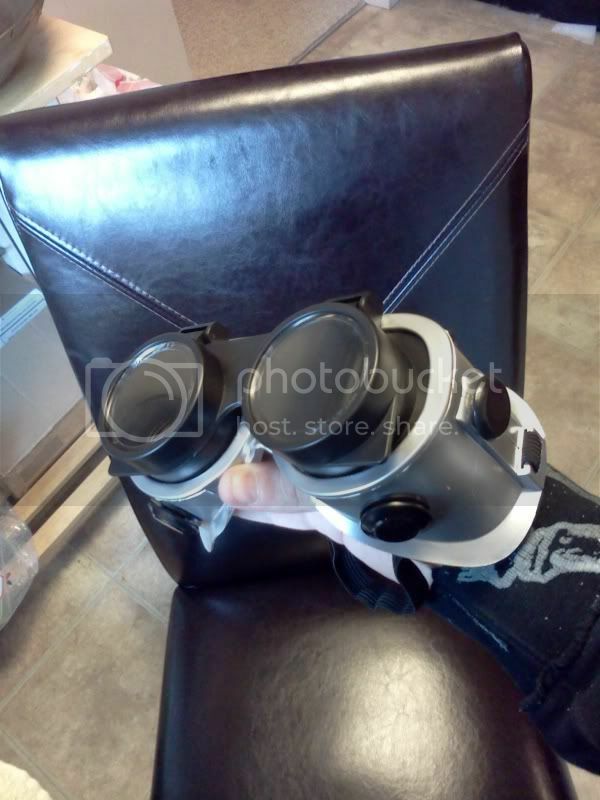 The goggles - The newer model from the same company that made the original goggles. Here they are disassembled for painting and then assembled in the next shot. I hit the green rubber frame with a couple coats of Duplicolor Adhesion Promoter so the paint would stick (rusoleum aluminum silver) and put the silver on thinly so they'd still flex well enough to reassemble without the paint cracking. 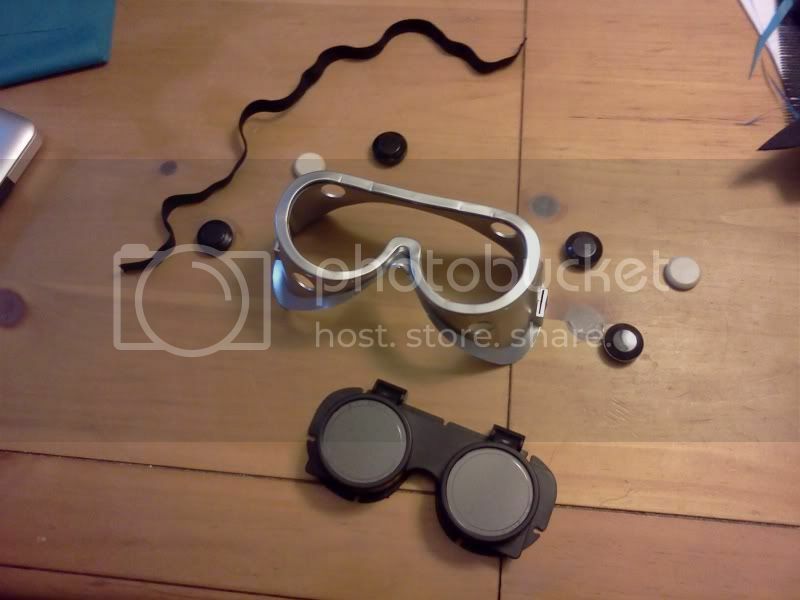 The two small white dots you see are actually appropriately-shaped magnets, which I later painted black and glued to the sides to form the side vents no longer present on this newer goggle model. I need to weather the goggles before the next party - they're too shiny silver! 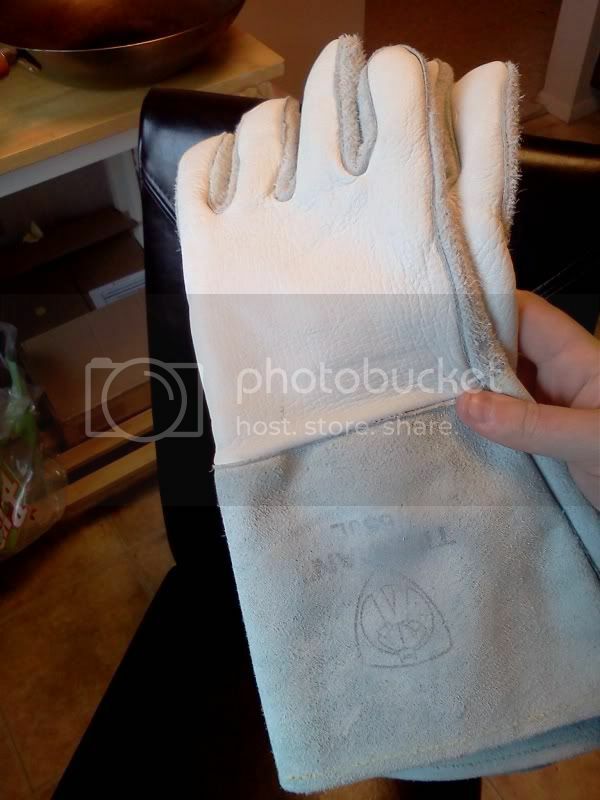 And the gloves, after sanding them forever to try to get rid of the logo. The pic doesn't do it justice; the logo is actually less visible than this when looking with the naked eye. I will do more before the next party, though, this coming weekend. Turned out great though I didn't have time to make any props either. If I can find a good complete pic I'll post it up.